Per the rockfall mitigation project has been completed. Marked as archived / Project Status: Complete on CODOT. scaling rock; removing scaled rock; and installing rock reinforcement, rock anchors, mesh anchors, and 160,000 squat feet of wire mesh. CCC Raptor Nesting Closure 1 (MM 270, W of Tunnel 1). Photo reconfiguration: Ron Keller. CCC Raptor Nesting Closure 2 (E of Tunnel 2). 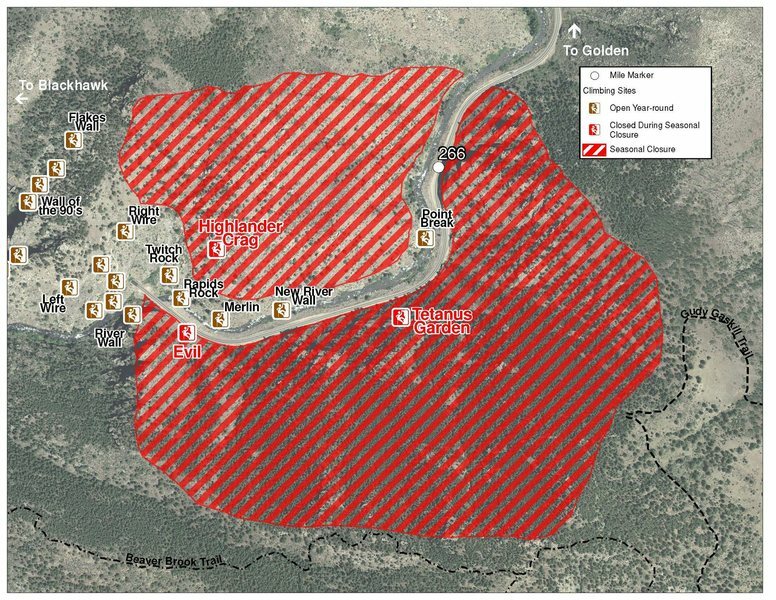 Update: as of June 9, 2016, this closure had been lifted, per Eric Krause, JeffCo OS Ranger. Photo reconfiguration: Ron Keller. 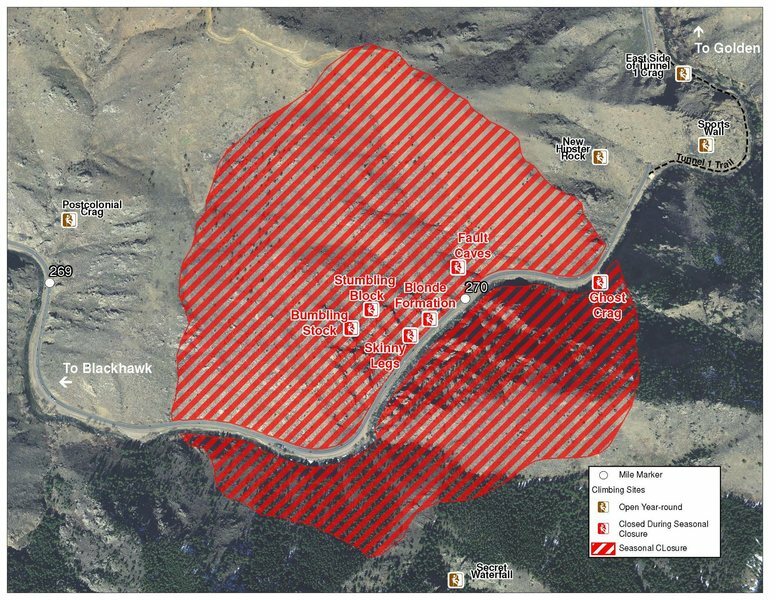 The two areas Jefferson County Open Space intends to close in Clear Creek Canyon, shown on the attached maps, encompass the active eagle nests. If the Clear Creek eagles continue to nest in the active nests, these areas will remain closed from February 1 through July 31. If the eagles choose different nesting sites, the closures will be adjusted accordingly to protect those eagles during their breeding season. After months of negotiation, Clear Creek County successfully acquired the 76-acre Oxbow Parcel that contains the Cat Slab cliff. While the cliff line is protected, the area is now officially open to the public. The County is working on developing and implementing a site plan to provide safe, off-road parking, which may include shifting the guard rail and gate to provide more parking as a short-term solution. Cat Slab was a popular crag before it was closed to the public in 2006 due to liability concerns. The County purchased the land using $725,000 in lottery funds, awarded by Great Outdoors Colorado (GOCO). The County was supported by numerous recreational groups, including the Access Fund, Colorado Mountain Club, Colorado Whitewater, Trout Unlimited, International Mountain Bicycling Association, and Rafting Outfitters on Clear Creek. Mr. Mistoffeles lies to the right of 'Rumple Teaser' and left of 'Gumby Cat'. The climbing is classic slab climbing. The bolting is very generous and the route is very enjoyable. The 5.9 moves will come at the 6th-10th bolt following the seam just right. A great route for the aspiring leader. Cheers !! 12 bolts - 2 bolt anchor. Approximately 105 feet from lower off. Would suggest 2 ropes, also for other routes at Catslab. Jerry Miller starting the crux. Sean Wood just getting off the deck. You're a good man, AC. Or woman. Might try the trad lead next time.